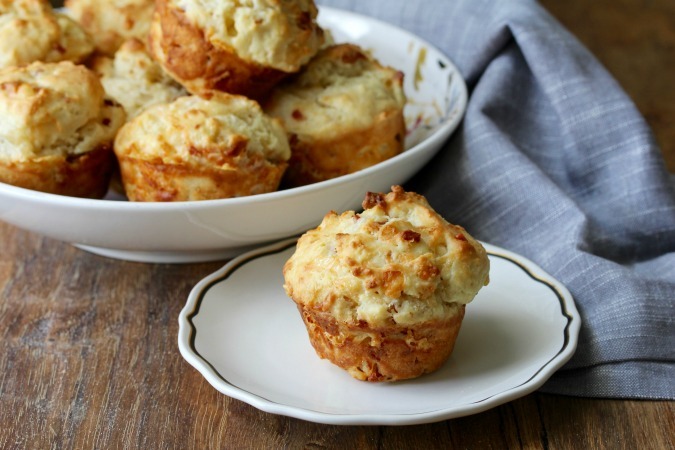 These Bacon and Gruyère Muffins are loaded with chunks of melty cheese and are so easy to prepare in less than two hours. 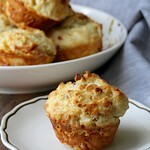 Even better, if you fry the bacon and dice the Gruyère the day before, you can make these muffins in less than an hour. You will look like a baking genius. If I had to pick just one cheese to bake with, it would be Gruyère cheese. Even though it is an aged cheese with a firm and slightly grainy texture, it melts perfectly. It has a mild, sweet, and nutty taste. To bring out the melty goodness of the Gruyère, I cut it into a small dice rather than grate it to better achieve little pockets of melty cheese. And then there's bacon. I used eight thick cut slices of bacon, which I fried until crispy, and then crumbled into bits. 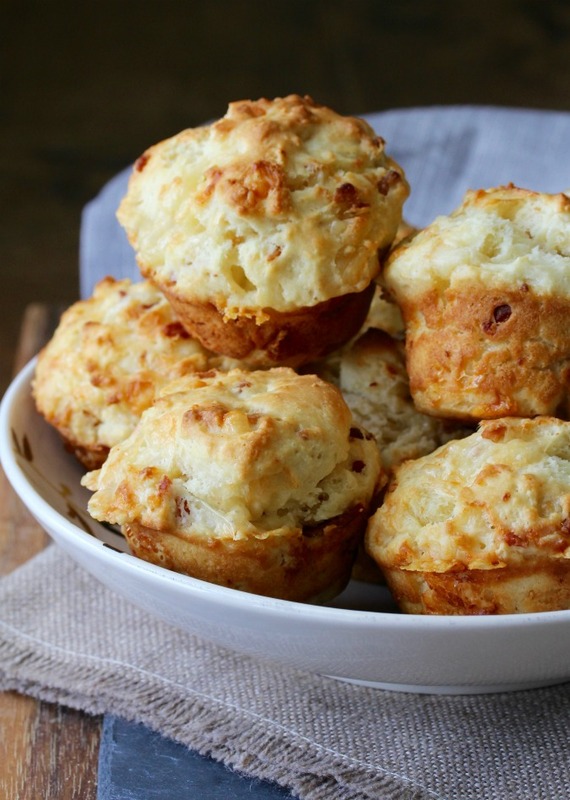 These bacon and Gruyère muffins are divine served warm from the oven. Almost biscuit-like in texture, they are the perfect savory breakfast muffin, and, with a salad, they are wonderful for lunch. 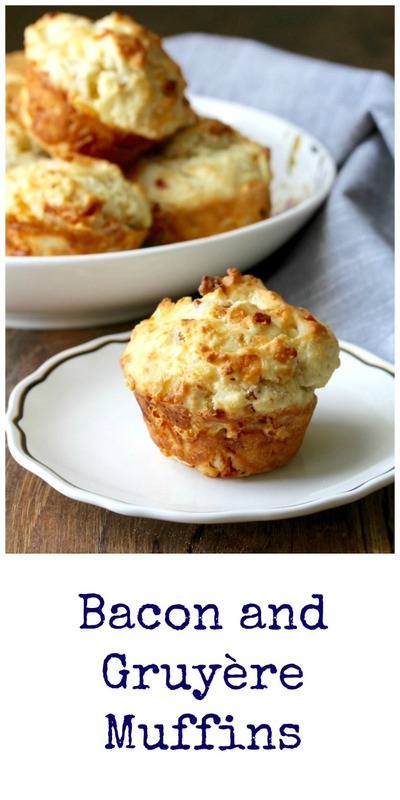 I do not recommend using paper liners with these muffins because the cheese will stick to the liners, and you'll miss out on some of the cheesy goodness. Instead, generously butter your muffin tin. I used a small thin knife to loosen the muffins from the tin, and they popped out easily. If you want extra bacon flavor in these muffins, substitute some rendered bacon fat for some of the melted butter. If you can't find Gruyère, or if you find that it is too pricey, you can substitute Swiss cheese. I will forgive you. On the last Monday of every month I contribute a new muffin recipe to the Muffin Monday baking group. I've got to say, this recipe is one of my new favorites. I know, I know... I probably said the same thing last month too. But seriously, unless you hate bacon and cheese, you need to give these a try. 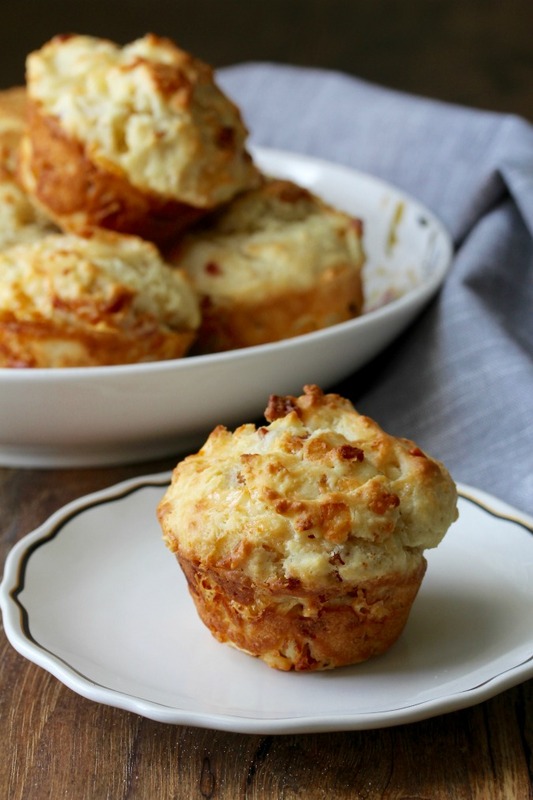 These bacon and Gruyère muffins, with a biscuit like texture and loaded with bacon and the best cheese for baking (in my opinion) in the world, will pretty much become your new favorite savory muffin too. Preheat the oven to 400 degrees F and and grease 9 cups of a 12 cup muffin tin. In a medium bowl, whisk together the flour, sugar, baking powder, and salt. In another medium bowl, whisk together the egg, butter/bacon fat, milk, and sour cream. add the liquid ingredients to the dry ingredients and stir with a rubber spatula until just moistened. Fold in the cheese and the bacon until just combined. Fill 9 cups of the muffin tin to the top with the batter. Fill the other three cavities about halfway with water. Bake the muffins for 20 to 25 minutes, until a toothpick comes out clean. Cool the muffins in the pan on a wire rack for 5 minutes. Using a small, thin knife, loosen the the muffins from the pan and cool on the wire rack. Serve warm or at room temperature. Wrap and freeze any leftovers. Recipe adapted from Williams Sonoma Muffins by Beth Hensperger, one of my favorite cookbook authors. 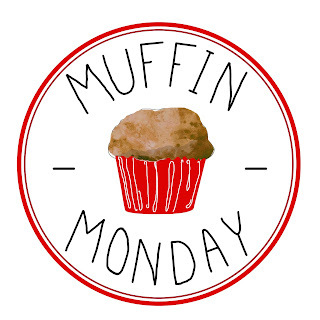 More muffins from Muffin Mondays! Would love one of these for breakfast right now, Karen. Hey Karen, I have been trying to find a good spinach and feta bread recipe, have you ever made one ? There is a bakery in Charlottesville, VA that makes it, but I have never had the opportunity to go there as yet to buy one. I've got a recipe on here called Assyrian spinach pies, which I posted a long time ago (just use the search box to find it) but I'm not sure that's what you're looking for. I also think that my Gruyere, Caramelized Onions, and Watercress Buns would adapt well to feta and spinach. Now I'm intrigued! I firmly believe Gruyère does not get the praise it deserves - it has SUCH unique flavor, and even the texture is a little different from other cheeses, I think. your muffins are always perfect! Thank you! and.... great minds think alike. Amazing that the grainy texture turns into total melty goodness. LOVE these muffins, Karen! I will definitely need to put these on the list - I'd be way more into these than the breakfast burritos I make for my husband. Thank you Lauren! I bet your husband would love these!